The Lambda Phi chapter at Florida International University is our chapter spotlight this month. 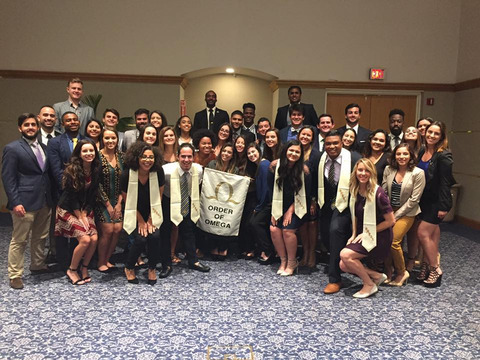 During the 2016-2017 academic year, the Lambda Phi chapter initiated 63 new members from all the representative Greek governing councils at FIU. The chapter hosted several programs on campus including events during National Hazing Prevention Week and Alcohol Awareness Week, and was recognized by Order of Omega headquarters with a 2016 Chapter of Achievement Award. It is no wonder then that the strongest applicant for the 2017-2018 Order of Omega Student Board Member position came from the Lambda Phi chapter (Aujanae Watson of Alpha Xi Delta). The Lambda Phi chapter is part of a very robust Fraternity & Sorority community at Florida International University that boasts 36 fraternities and sororities who, collectively in 2016-2017, combined to complete 30,788 service hours and donated over $350,000 to various charities! Read more about Lambda Phi’s 2016-2017 achievements in their Toga Times newsletter!